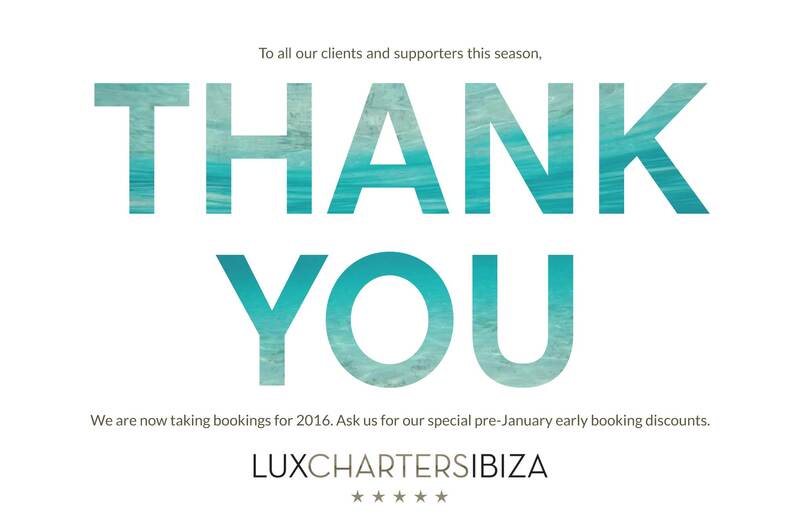 Now that the closing parties are officially over and the days are getting shorter, we would like to thank all our clients for a fantastic season in 2015. Our office will remain open year round, as we continue to work behind the scenes to improve our website and systems, in order to offer you an even greater experience in 2016. We are now taking bookings for the 2016 season. As you may know, there is a limited supply of good boats and demand is predicted to be at an all time high this coming year, as Ibiza is once again expected to surpasses itself for being one of the coolest holiday destinations in the world. For the best selection of boats, a week long charter on a catamaran, motorboat, sailboat or superyacht, ask us for our special offers and early booking discounts available now until the beginning of January.